Seven fire appliances and 35 firefighters were called to tackle a fire at a retail park in County Londonderry on Sunday night. 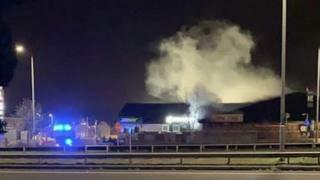 It centred on the Indus Valley restaurant at the Riverside Regional Centre, Coleraine, Northern Ireland Fire & Rescue Service (NIFRS) said. The alarm was raised at about 22:00 GMT. Firefighters from Coleraine, Portstewart, Portrush and Derry were at the scene. Footage of the fire at the Riverside Regional Centre in #Coleraine last night by @KnightMcQuillan. It is understood a number of businesses in the centre were affected. NIFRS said the fire was dealt with at 00:46 GMT on Monday. The cause is under investigation. In a post on social media, Hullabaloos Restaurant, one of the businesses affected, said it would be closed on Monday "due to a fire next door." "We are thankful that no one was injured and luckily the fire did not spread to our unit but sadly we do have some smoke damage that our amazing staff will be spending the day cleaning up," the company said.